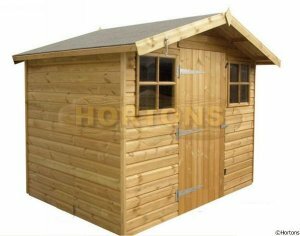 If you essentially require a shed but want something that looks a bit nicer, or a summerhouse that offers a bit more practicality, then this is the building for you. This building is the perfect storage shed that offers that bit extra. Nothing is in full view behind the fully boarded door which forms a barrier to viewing what is inside, but iit looks like a summerhouse which has a roof canopy and windows either side of the door which make it look like a tradition English summerhouse.